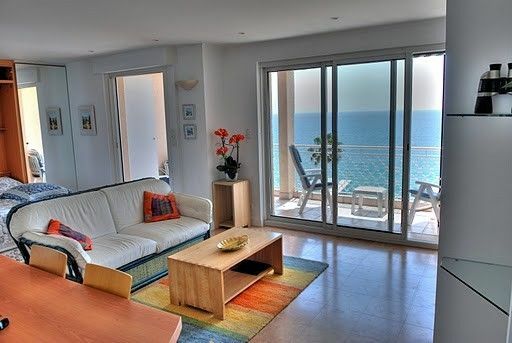 Stunning, panoramic views of the Med from large private balcony- perfect for enjoying al-fresco dining, sunbathing or just relaxing and taking in the views. Bright, airy, modern decor throughout. Neatly apportioned with double-bed at one end of main area and a seating area with sofa-bed at the other end. Fitted wardrobes with ample hanging and storage space. Nice Airport is a 30 minute drive from the apartment. You can either hire a car at the airport or take a direct coach from the airport to Cannes. The coach service runs every 30 minutes and will take you directly to the central bus station in Cannes which is a 5 minute walk to the apartment. Keys will be available on arrival at the apartment from the resident concierge. Very efficient underfloor heating system for the winter months. There is a 37' (94cm) flat screen TV with Orange France cable which has 10 channels in English, and a DVD/video player that will also allow CDs to be played. Table and four chairs on the balcony as well as two relaxer-chairs. The apartment has more Positive Reviews than any other Cannes Studio. iPhone/iPod Charger/Dock. Krups Nespresso coffee machine with complimenary coffee pods. Who is the Vrbo Bear? Great studio. Everything was clean, everything worked. Nice view! Very conveniently located, very clean, comfortable, perfectly equipped - excellent. The location was perfect! The views and the outside deck were stunning and Chris’s place was very spacious and well equipped! Even the murphy bed was comfortable! The view will blow you away! This property if perfectly situated in Cannes. Close enough to walk wherever you want, but also remains relatively quiet at night. Checking in and out was a breeze. This is the perfect place to stay for a couple visiting Cannes. An air conditioned studio with everything you’ll need for a relaxing stay. The view from the balcony is just the best ! We spent many hours sipping wine and watching the world go by! It was just a quick hop across the road for a swim in the sea too. Lots of local bars and restaurants. We had a fabulous time exploring this wonderful city. Every time we opened the door to the apartment we were wowed by the view! The studio had everything we needed for our stay, and while not luxurious, was very cozy, comfortable and clean. Kitchen was great. Made a couple of meals after shopping in the nearby Forville market. Service was great, key pick up and check in was easy. Chris (owner) reached out before, and during our stay to check in and quickly answered an e-mail. He also provided a handy book of information about the apartment and the area which was helpful. Location of apartment was perfect. Could walk to old part of city, market, the old port and right across the street from beach! Would stay again in a heartbeat when back in Cannes. Approx 15 metres to sandy beach from building entrance. Excellent local restaurants (beach and street level) within minutes of the apartment. 5-10 minute walk to La Croisette / Palais des Festivales, old harbour, bus station (that has regular half-hourly service to airport), more bars and restaurants and good shopping. Daily markets (fresh produce, antiques, etc) are also within 5-10 mins walk. We can be seen on Google Street View on Google Maps. Type in 22 Boulevard Jean Hibert, Cannes. Our beach entrance is between Le Madrigal and Le Tartar restaurants. Residence St Remy can be seen above the door. Special rates apply for the Cannes Film Festival week and other Festivals and Congresses during the year. Additional discount will be given to returning clients.